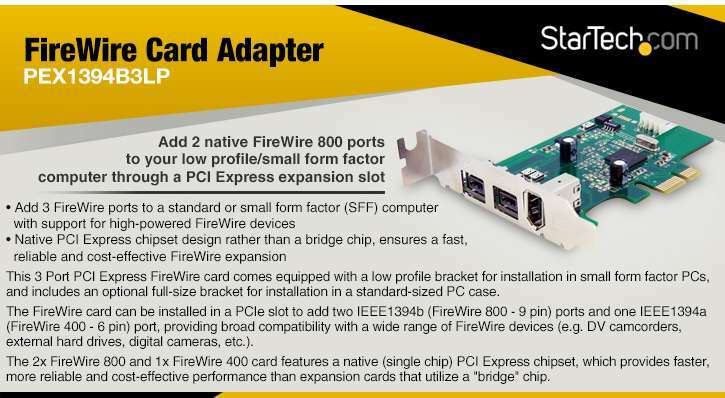 Equip your PC with the StarTech FireWire Card Adapter. 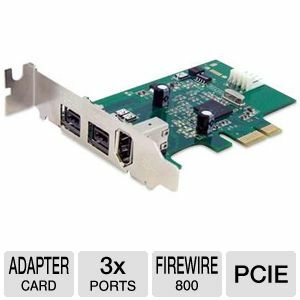 This adapter features PCI Express Interface which delivers quick and constant performance than expansion cards that utilize a "bridge" chip. It is provided with 3 ports to integrate multiple devices at the same time. You can enjoy easy and quick installation with its PCI Express Interface. Plus, the Hot-swapping feature allows you to connect and disconnect devices without powering down the system. This adapter is configured with a low profile bracket attached and also includes an extra full profile bracket. Grab the StarTech FireWire Card Adapter today! Dimensions:�0.71" x 3.54" x 4.72"